Berlin Single 1-Door Wardrobe ?. Sonoma Oak. Available in Sonoma Oak. The Sonoma Oak finish is scratch-resistant and so easy to keep clean with just an occasional wipe down. Quick Code: X-ROBBER1DR Oak Single Robe. Jupiter Sliding Door System 1200mm 30kg. UK's leading supplier of sliding door systems, kitchen & wardrobe pull-out storage, ironmongery, furniture and furniture fittings. Make your wardrobe more accessible with pull down hanging rail and sort all the t-shirts and underwear using our wire pull out baskets. Adjustable soft close hinges ensure that the door hangs straight and doesn't slam. Manufactured from high quality composite with a simple matt effect finish to the carcass and luxury high gloss door fronts. Mirrored Door. Ideal For Creating That Fitted Wardrobe Look Whilst Maximising Storage Space. 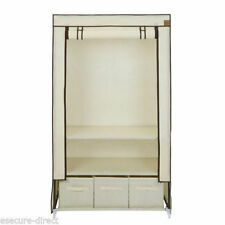 Our New Range Of Left Or Right Corner Wardrobes Are Available In Oak Or White With Various Stylish Door Combinations. This wardrobe is built with shelving and a hanging rail, having 2 fixed shelves and 2 loose shelves, and a hanging rail under the top shelf. 1 DOOR WARDROBE. WITH FOUR SHELVES. AND OPTION OF HANGING RAIL. Particle Board construction for added lifespan. Weight capacity of 65kg.|3 x shelves behind door, 3 x open shelves, 2 x Drawers|Design to enhance most room d꤯r|Multi-purpose storage solution for any room.|Overall Size: 88W x 40D x 134H cm. 2 People Assembly Required. Adjustable soft close hinges ensure that the door hangs straight and doesn't slam. Our REFLECT high gloss bedroom furniture range is no exception. With its clean simple design and rich high gloss finish, this set will blend in seamlessly with any modern or traditional bedroom. Ikea wardrobe white with black door. Two shelves and rail inside. Gc collect from poole before sat 27th. Ideal For Creating That Fitted Wardrobe Look Whilst Maximising Storage Space. Gloss White Door. Black Slim Wardrobe with shelves. Measures H 72.5", W 15", D 20" not including handle. In excellent condition. Collection only and cash on collection. Need gone asap. Here I have a single very tall white wardrobe. Has been in a bedroom which gets quite a lot of sun and think this may be a reason why. Overall still though in reasonable condition and can be used. Back of wardrobe I believe is fibreboard. Single Walnut Caracas 1 White Door. Made of wood effect. ordered over the weekend will be dispatched the. TR21-25, JE, GY, AB31-56. PH17-26, PH4-44, PH49-50, ZE, BT, IM. IV, HS, KA27-28, KW, PA20-49, PA60-78. 1 Door Corner Wardrobe with White High Gloss Doors and Grey matt body. 1x (SZFN1D/A) 1 Door Corner Wardrobe. 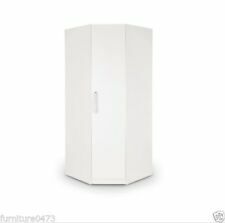 Corner Double Wardrobe white gloss grey yellow customise modern Graphic New. It also has a reversible panel insert, so that you can choose which option of your coloured side strip to display. Wardrobe size :approx. - W80cm x D80cm x H187cm = (W31" x D31" x H73.5"). Gloss White 1 Door Corner Wardrobe. Corner Wardrobe. 1 Door Corner Wardrobe. 1 Door Wardrobe. 1 Door 2 Drawer Wardrobe. 2 Door Wardrobe. Wardrobe size :approx. - W40cm x D52cm x H187cm = (W16" x D20.5" x H73.5"). Matt White 1 Door 2 Drawer Wardrobe. 2 Door 2 Drawer Wardrobe With 2 Door Top Storage Box. 2 Door 2 Drawer Wardrobe. Matt White Door. Wardrobe size :approx. - W80cm x H187cm = (W32" x H73.5"). Matt White / Oak Veneer 1 Door Corner Wardrobe. Oak Veneer carcass. 1 Door Wardrobe. 1 Door 2 Drawer Wardrobe. 2 Door Wardrobe. 2 Door Wardrobe With Mirror. Single rail with top shelf for storage. Can be fixed to wall. height 200cm x width 50cm and depth 61cm. Only available until the 26th April. Mirrored Door. Our New Range Of Left Or Right Corner Wardrobes Are Available In Oak Or White With Various Stylish Door Combinations. 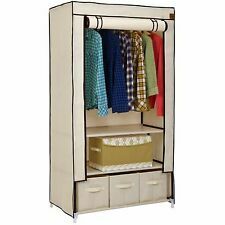 Ideal For Creating That Fitted Wardrobe Look Whilst Maximising Storage Space. Ideal For Creating That Fitted Wardrobe Look Whilst Maximising Storage Space. 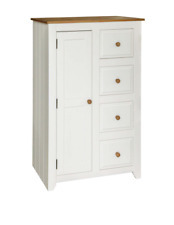 Our New Range Of Left Or Right Corner Wardrobes Are Available In Oak Or White With Various Stylish Door Combinations. White Door. Wardrobe size :approx. - W80cm x H187cm = (W32" x H73.5"). Oak Veneer 1 Door Corner Wardrobe. Oak Veneer carcass. Oak Veneer Door. 1 Door Wardrobe. 1 Door Wardrobe With Top Storage Box. 1 Door 2 Drawer Wardrobe. Wardrobe size :approx. - W40cm x D52cm x H187cm = (W16" x D20.5" x H73.5"). Gloss White 1 Door 2 Drawer Wardrobe. 1 Door 2 Drawer Wardrobe. 2 Door 2 Drawer Wardrobe. 3 Door 4 Drawer Wardrobe. 3 Door 2 Drawer Wardrobe With Mirror. Pax Vikedal Mirror Door 195 x 50 cm - Ikea and one white wooden door.